Last summer, Wet ‘n’ Wild Las Vegas opened and InPark took readers inside for a first look. With the park completing a successful second season, we went back for a second look and conversation with the operators. Wet ‘n’ Wild Las Vegas is a partnership between SPB Partners (a private equity fund managed by Roger and Scott Bulloch) and Village Roadshow Theme Parks (for more on Village Roadshow and their expansion plans, read our interview on p.21). Investors include Andre Agassi, Dr. Steven and Karen Thomas (Thomas & Mack Companies) and members of the Binion family. It opened May 25, 2013. 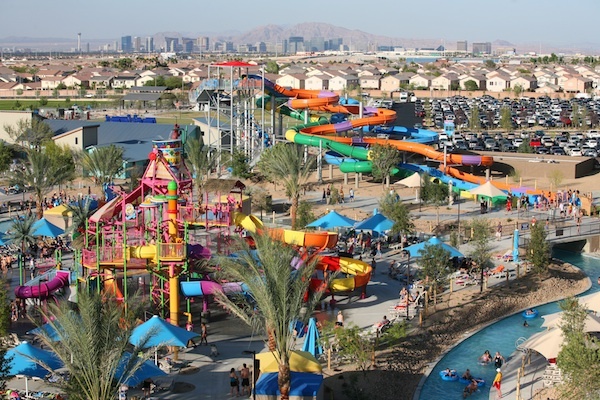 While not formally part of the ownership structure, Kevin Orrock of The Howard Hughes Company and Clark County District F Commissioner Susan Brager were instrumental in the development of Wet ‘n’ Wild Las Vegas. The land is being leased from The Howard Hughes Company LLC and is contiguous to a park controlled by Clark County. According to Wet ‘n’ Wild Las Vegas General Manager Takuya Ohki, Howard Hughes owns most of the land in this area, and had earmarked a chunk of land for park or athletic field development. With the county seeking a source of tax revenue, the deal with Village Roadshow was a win for everyone, taking half the land off Hughes’ hands for development, and providing tax revenue to the county which doesn’t have to develop or maintain the land. Waterslides, says Ohki, are the “eye candy of the park” and a major part of the guest experience. He explained that to help keep the slides looking their best in Vegas’ unrelenting sun, Wet ‘n’ Wild opted to use SilkGel slides from WhiteWater, which come with a 10-year warranty against fading. “We ask WhiteWater to come to us with new technology for the park,” he says. “WhiteWater is a great partner to work with, and we provide a testing ground for them.” The park has recently been testing WhiteWater’s Slideboarding product, which will be available to attendees of the World Waterpark Association’s mixer on Wednesday, October 29th, 2014. 2014 saw Wet ‘n’ Wild also add a major ProSlide feature: the ProSlide Tornado, designed for a shared thrill where guests can ride together and watch one another’s reactions as the raft navigates the slide. With water being a precious commodity in the desert, the park was designed to minimize water loss. Since evaporation is the primary enemy, the park stores excess water underground as much as possible. And instead of having a 3-4 foot deep pool at the end of slides, the park employs shallower run-outs that hold only about 12 inches of water and are sufficient to slow guests down at the end of the ride. Water that splashes from the run-outs flows through grates and to the filtration system and holding tanks. Ohki noted that the run-outs provide the additional benefit of reducing the height limit to 42 inches instead of the more common 48 inches. Waterparks serve community interests in more ways than one. “A season pass here is affordable compared to the cost of maintaining a pool at home, and a waterpark is a more efficient use of water resources than everyone having their own pool,” said Ohki. Wet ‘n’ Wild reflects the growing importance of technology infrastructure in parks. Ohki prefers revenue share systems with such vendors as Omniticket, which provides the park’s ticketing suite. “A revenue share gives the developer incentive to keep improving the product,” he says, noting that as a customer, he gets the benefit of feedback from the supplier’s entire client base, which tends to be reflected in software and system updates. Since Wet ‘n’ Wild uses the Defender filtration system, we asked the manufacturer, Neptune Benson’s Director of Marketing, Jill Bibby, to tell us more about the product. What have the options been for water filtration? Filtration and disinfection for attractions have changed dramatically over time. In years past, choices were limited to cartridge, diatomaceous earth (DE) and sand filters. Typically cartridge filters are hard to clean, expensive to replace and do not achieve the water quality you get when DE is used. DE, on the other hand, affords good water quality but is messy to work with and requires special disposal. Sand filters tend to be user-friendly but have a large footprint and use extra energy and water for backwashing. For a waterpark in particular, the large number of sand filters required to do the job tends to take up quite a bit of space and consume a lot of water. The Neptune Benson Defender® filter utilizing regenerative media filtration (RMF) technology was an advancement in its ability to remove particles down to 1 micron in a single pass. The RMF system filters on the premise of surface filtration as compared to a depth filtration function with sand filters. With approximately 10 times the filter area in an RMF system, the dirt holding capacity was vastly improved compared to sand filters. Wet ‘n’ Wild’s Lazy River, Wave Pool and Children’s Play Area are all protected by Defender®. What are the benefits and costs of the Defender system? 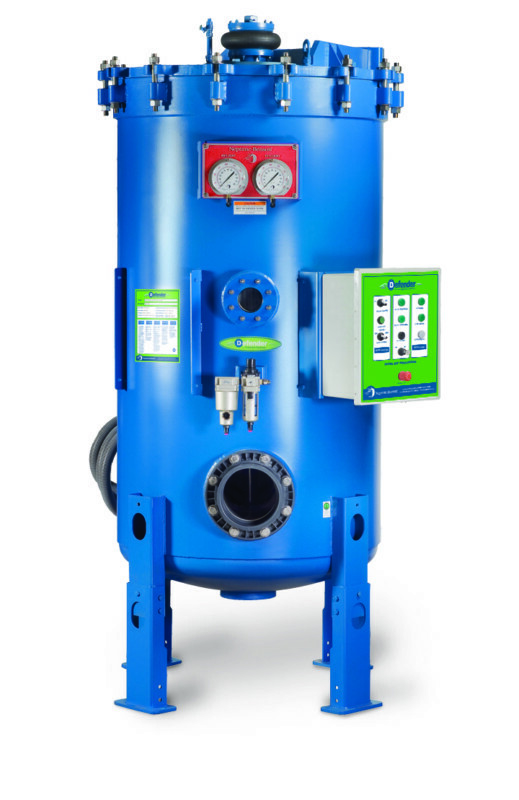 The primary benefits of the Defender filter start with a filter room footprint that is roughly ¼ of the space required by conventional sand filters. On a big park, this translates to major construction savings and possibly the option of including more attractions with the space savings. The technology of the design virtually eliminates the costly infrastructure of drainage systems and waste basins as required with sand filters. The unique design and operation of the RMF filter saves millions of gallons of water annually on average size parks due to the regeneration (bumping) process that dramatically prolongs the filter cycle. Some parks may achieve 3 week long filter cycles as compared to 1 day with sand filters. This translates to major savings in water, energy, waste and chemicals. One of the other areas of financial benefit is the savings in energy, related to the reduced head or pressure loss in the system. In most cases, there is a drop of roughly 10’ TDH in an RMF designed system compared to sand. This is also related to the function of depth vs. surface filtration. Without having to push the water through the sand bed, the system pressure is favorably reduced lowering horsepower requirements and daily power consumption. While there is an up charge for the Defender (RMF) filters, some parks have realized paybacks in as little as one year. What else should facilities like Wet ‘n’ Wild consider when examining filtration systems? Parks should think about, and account for, resources like water and wastewater, fuel and chemicals and electricity. The US average for water and sewer costs is $7 per 1,000 gallons. For electricity, it’s $0.08 to $0.12 per kilowatt hour. Fuel and chemicals include gas or oil for heating, chemicals for maintaining the water and storage for those chemicals. Take a look at your facility’s footprint. Consider the labor costs to build or retrofit, your mechanical room space, backwash holding tanks and whether or not you are looking to earn LEED points or otherwise improve your facility’s environmental footprint. Finally don’t forget to take ongoing equipment maintenance into consideration. The systems you choose can have a dramatic impact not only for today but for tomorrow as well.